FactCheck looks at whether he’s right. 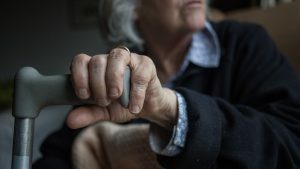 “The Government’s National Living Wage (NLW) will be uprated [increased] every year until 2020 until it reaches 60 per cent of median earnings. This means that as the economy slows and wage growth slows, and pay falls in real terms for the majority, the planned rate of the NLW is downgraded. “When the NLW was first announced by George Osborne, it was meant to hit £9.30 per hour by 2020. Today the OBR [Office for Budgetary Responsibility] is projecting that it will be £8.75 in 2020. “Analysis by the Labour Party shows that if the Tories continue on the same trajectory of failure on wages, the NLW could be as low as £8.25 by 2020. The NLW would be lowered for every year between now and 2020. The rate of the National Living Wage (NLW) is closely linked to average median earnings. So, if the average wage falls, so will the NLW. 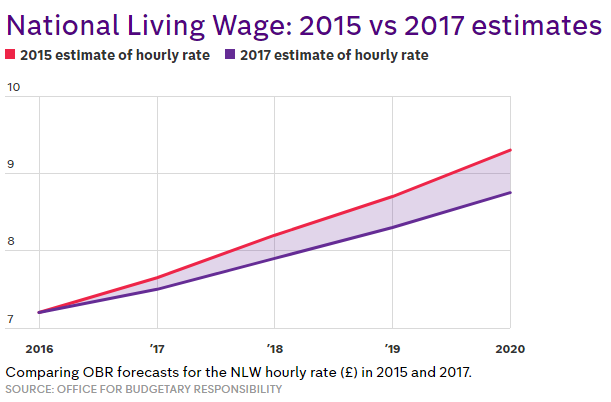 As Labour points out, the expected NLW hourly rate was originally forecast to hit £9.30 in 2020, but has since been revised down to £8.75 by the OBR. That’s because median wages haven’t risen as fast as was first predicted. But strangely, Labour has chosen not to use the OBR’s latest forecast when making their own calculations. 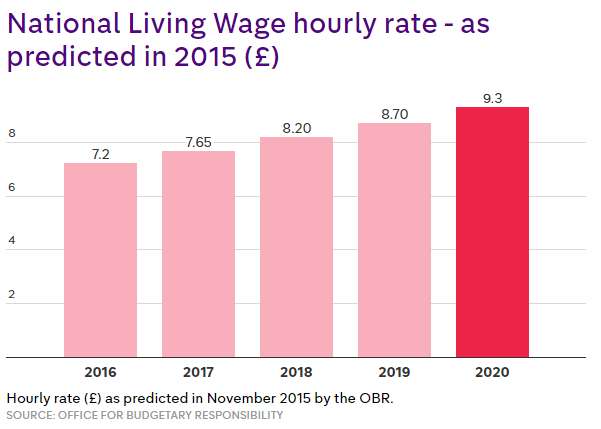 Labour seems to suggest that the OBR is still overestimating the future level of the National Living Wage. They claim that it will actually fall as low as £8.25 an hour by 2020. It’s on the basis of this number – not the OBR’s official estimate – that Labour have reached the £5,000 figure. They reckon that in 2018, someone on the NLW will receive £1,223 less than originally predicted. 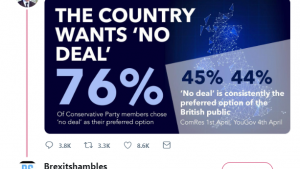 In 2019, they’d lose out by £1,630, and by a further £2,140 in 2020. The mathematicians among you will see that works out at a total of £4,993 over three years. But that doesn’t answer the question of why Labour thinks that the National Living Wage will fall to £8.25 an hour in 2020 – when the OBR says it will be £8.75. They haven’t made any public explanation of how they’ve reached this lower figure. But their statement says that they’ve based their claim on the assumption that the Tories will “continue on the same trajectory of failure on wages”. This suggests that they’ve simply taken a recent trend in wage growth and assumed that it will continue to 2020. This is a significant claim to make without providing more evidence – especially as it contradicts the official estimates from the OBR, which are themselves based on wage predictions. That may explain why Mr Corbyn said that the NLW “could” fall as low as £8.25 an hour, without stating it categorically. How much are people on the National Living Wage losing out? So we know that the figure of £8.25 is contestable. But we also know that NLW is, and will be, lower than was predicted when the policy was originally announced. But since then, it has revised down its predictions because median average wages haven’t grown as quickly as expected. We can see from this graph how the gap between the original prediction and the later forecasts has widened over time. The shaded area equates to money that would have gone into the pockets of people on the National Living Wage that they now won’t be getting. How much does that add up to? By our best estimate, between 2016 and 2020, people on the National Living Wage will have received £2,854 less in total than they were originally predicted to get. Between 2018 and 2020, people on the National Living Wage will receive £2,548 less in total than was originally predicted. That’s half as much as Labour claims people will lose over the same period. It’s easy to see why labour again get there figures wrong there using the much (respected) by labour the Abbot school of mathematics. 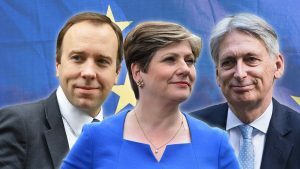 Also if labour were to get in power and being ex labour and knowing there political mandate the country will again have massive debts so the out look for reaching anything near the £9.20 will be nothing more than a labour false promise. The National living wage, even at £10 per hour will not be enough to keep up with the National average day to day household spending. To keep up with just paying rent, mortgage, gas, electricity, food, clothing, Council tax, Running your car and looking after the day to day care of your kids. The only way to make ends meet at a struggle, is to have a partner working adding both wages together. The National living wage is a joke and an insult to mankind that has to survive on it. The rich and over paid, pay out the same amount of money as the under paid, in there day to day life. The emphasis is on COULD, there’s no definitive! “Labour have reached the £5,000 figure. You’re actually nit-picking over £6?? Corbyn said ‘could’ because there are no factual in ‘projecting’ figures! What a load of crap this piece is! Oh good. So the wage people will have to live on by 2020, according to the OBR, will fall to only half as much as Jeremy Corbyn’s figures predict. Something to look forward to then. 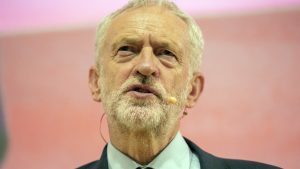 Labour claims people may lose up to £5000, not will lose £5000 as you state when you claim in the final paragraph ‘That’s half as much as Labour claims people will lose over the same period.’ ‘Will’ ‘may’ ‘could’ you really need to be more precise if you really are fact checking and not propagandising. Let’s leave that to the politicians, shall we!